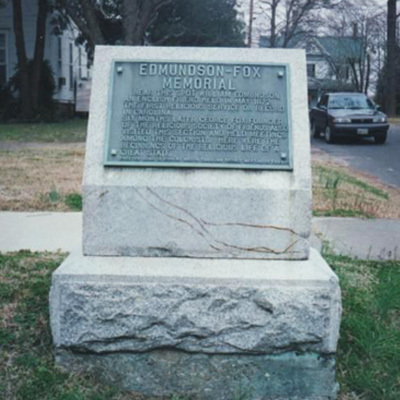 The Edmundson-Fox Memorial is an unadorned bronze tablet attached to a lectern shaped block of pink granite standing several feet high including the base. Quakers moving into northeastern North Carolina from Virginia in the late 1600’s became responsible for much of the organized religion in the colony. The claim that Edmundson and Fox held the first organized religious service in North Carolina ignores the baptism of Manteo and Virginia Dare in 1587. The marker is located in Hertford at the corner of N. Church St. and Newby St. on the right hand side as one travels north. The marker stands on the grass by a sidewalk, in a residential area, one block from the Perquimans River.